Singer/songwriter Pearl Charles has a knack for writing melodic, low-key indie pop with a jangling country tone. A lifelong musician, the Los Angeles native first gained exposure as one-half of lo-fi Americana duo the Driftwood Singers, who released a pair of EPs and one full-length in 2012. A stint playing drums for garage pop act the Blank Tapes, introduced her to the crew at Burger Records, who offered to release her first solo effort, a 2015 self-titled EP. The raw '60s-inspired garage and light psych-pop of that first release soon gave way to the more polished pop and country-rock of 2018's Sleepless Dreamer, Charles' full-length debut and first for Brooklyn indie Kanine Records. Support from Sofia Wolfson, a singer/songwriter born and raised in Los Angeles. Her musical influences range from Joni Mitchell to Blake Mills, The Band to Fiona Apple, which can be heard in her music. 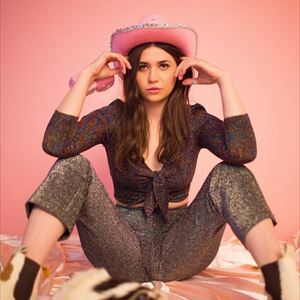 Her latest EP Side Effects, a 3-song release, was produced by Marshall Vore (Phoebe Bridgers, Korey Dane) at Vore’s home studio in Pasadena.